Soweto Outdoor Adventures has built a trusted relationship within the community as we empower local businesses and support the community in which we operate. Using this win-win relationship, we are able to give outsiders a unique view into the real Soweto and our visitors experience a truly exceptional grassroots tour of South Africa’s most popular township turned city. Founder and Director of Soweto Outdoor Adventures Kgomotso Pooe. 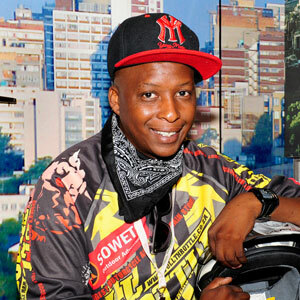 During his 10year tenure, township entrepreneur guru Kgomotso Pooe had a vision of bringing quad bikes to Soweto and turned a patch of grass at a derelict power station into what is today just one part of his growing tourism empire. In May 2013, Pooe founded SoWeToo Hop On-Hop Off Tours, along with City Sightseeing Johannesburg. 38-Year-Old Tourism and entertainment chief whip has extensive knowledge of the tourism scope as a former flight attendant, aspiring pilot and advertising executive sums up that he wanted to be a serious player in South Africa’s tourism industry, for the sheer experience he needed to a base in Cape Town. His recent activities were include introducing more adventure in a thriving township, where he introduced paddle boats on his thrill list of adventure. As for his future dreams, tourists might be seen zipping around Cape Town townships in quad bikes if Pooe has his way. • 2013 Aspiring Entrepreneur of the Year at the Gauteng Lilizela Tourism Awards. Kgomotso is a frequent speaker and voice for SMME’s in the tourism space and serves the community by giving back creating jobs and supporting community businesses around his businesses. Kgomotso Pooe left his Team and Brother Suping to manage and grow the Joburg office. SOWETO. Once a dirty mining township, it emerged as the heart of political resistance in South Africa and gave birth to the Freedom Charter. But this rich history is just a part of what is today a vibrant city that never sleeps. Having undergone massive development over the past decades, Soweto now boasts eateries, nightclubs and a four-star hotel alongside its traditional venues. It is the heart and soul of Johannesburg – a multicultural metropolis where all 11 official languages are spoken. Now you can experience Soweto from a local’s perspective – travel the back streets, explore famous neighbourhoods and enjoy local delicacies.